Lehigh Technologies is a specialty chemicals company that produces highly engineered, versatile raw materials called micronized rubber powders (MRP) that can replace oil- and rubber-based feedstocks in a wide range of applications. MRP delivers product performance, lower production costs and reduced waste. By transforming waste materials into high-value products, Lehigh provides a sustainable solution to the important environmental problem of end-of-life tires and other post-industrial rubber material. In October 2017 we became part of the Michelin Group (see press release here). Michelin, a world leader in the tire industry, is committed to sustainability under their "4R" strategy (see link to Michelin website here) and Lehigh Technologies is now an important part of implementing the "recycling" component of their sustainability commitments. Lehigh is in the new business unit called "High Technology Materials", created during the 2017 restructuring of the Company. Lehigh's mission to serve the entire range of industries where MRP adds value remains in place. The combination with the Michelin Group will support Lehigh's expansion and technology development plans. We have two main product lines: PolyDyne™ and MicroDyne™, which range from 830 microns to 50 microns in size. All of these products are manufactured from end-of-life tire materials and post-industrial rubber using our proprietary cryogenic turbo mill technology. We also have a number of innovative new compounds, including EkoDyne™, Rheopave™ and Zenoflex™. Our high quality, micron-scale MRPs are suitable for a number of high-performance consumer and industrial applications, including tires, plastics, asphalt and construction materials, among others. Importantly, MRPs are a lower-cost, sustainable alternative to virgin rubber and oil-based materials, providing a boost to the bottom line. Our customers include the largest tire companies in the world, leading flooring manufacturers and companies at the forefront in the construction materials, asphalt modification and coatings segments – to name just a few. And as these customers know, we’re not just a manufacturer of specialty chemicals—we’re also a technology company. Our best-in-class Application and Development Center (ADC) is staffed with a team of experienced industry professionals and experienced scientists who leverage their in-depth understanding of how MRPs function to help customers develop and optimize tailored formulations using our product. 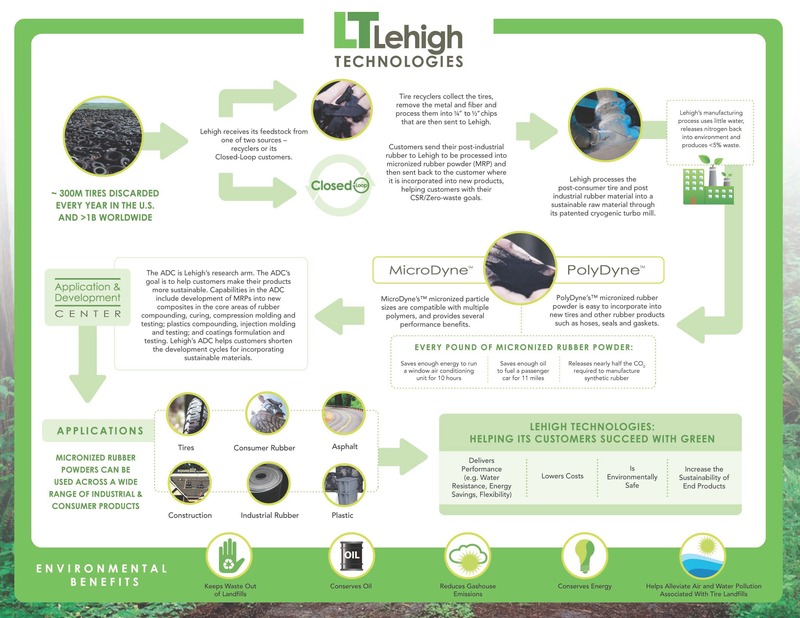 Click on the image below to learn more about Lehigh Technologies and Micronized Rubber Powder.